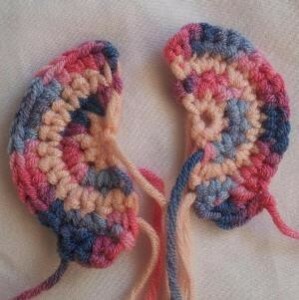 You may make as many of these little crochet elephants as you like, both for personal use and for small-scale sale. 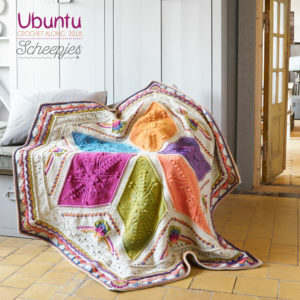 All I ask is that you credit me as the designer as and when you make anything using this pattern (even if you alter it). You may in no way reproduce or copy the actual pattern! She is 11 cm front to back (not including her trunk) and 9 cm high (4.3″ x 3.5″). Meimei has movable limbs, so she can stand and sit with ease. 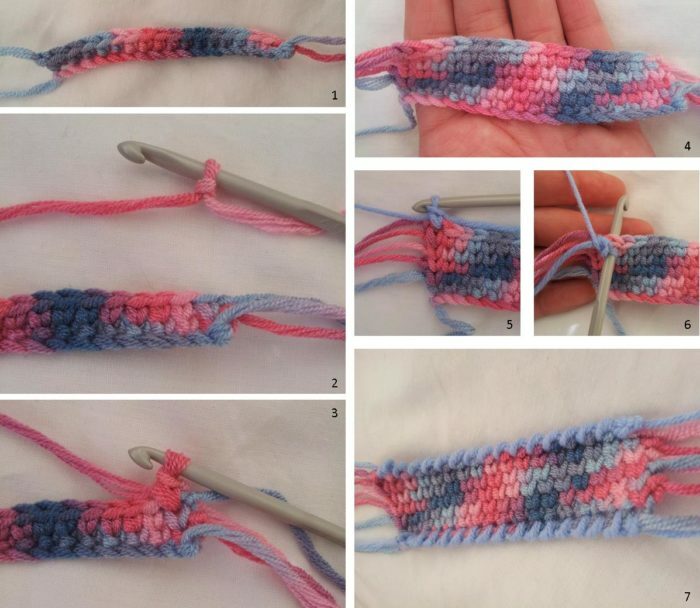 Short rows are used for shaping, however, don’t be daunted, the pattern contains tons of photos and you can also have a look at this tutorial I did about short rows. 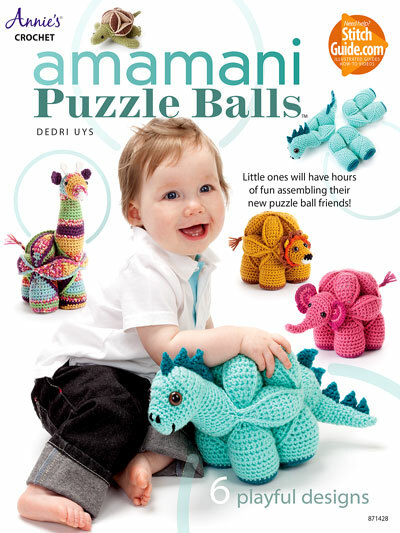 The pattern includes an optional rug that you can sew onto her back. The rug is tiny, but uses more complex stitches. 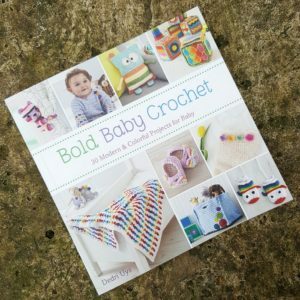 I thought it would be the perfect chance for you to get rid of those crochet cobwebs. 4 mm Crochet Hook (US 6/G UK 8) – you can use a smaller hook if you prefer. It’s not going to make her all wonky, just smaller. Please note: you will only use the crab stitch and the waistcoat stitch for the optional rug, so don’t be too stressed about them right now. 5. Skip 2 st’s. 4 x sc in the third st. Skip 1 st and sl st into the next st. Bind off and work away your tails of yarn. There are plenty of ways to change colours. My favourite method is to change colours on the last yarn over of the last st on the row before the colour change. So, for instance, for the last sc of Row 1: still using main colour (MC), insert hook into stitch and pull up a loop. Change to Contrasting Colour (CC). 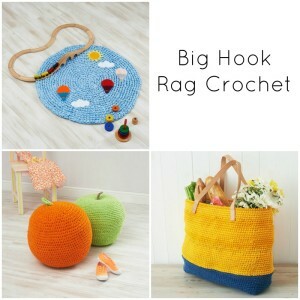 Yarn over and pull through both loops on hook. Ch 1 and turn as normal. Work the next row in CC and repeat the procedure for the last st of the round. I tend to carry the colour I am not using instead of joining it for every second row. All this means is that you crochet over the yarn until you get to the end of the row. The yarn will then run “underneath” the stitches and be hidden from view. 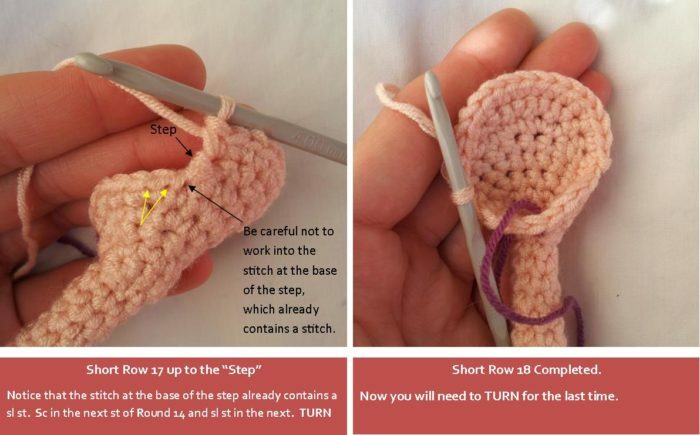 Dropsdesign has one of many YouTube tutorials that shows you how to carry the yarn. This photo shows you the end of each row. You will be working into these rows to attach the ear to the head. If you get stuck during the attachment of the ear, please refer back to this diagram. Please bear in mind that this diagram shows the right side of the ear. 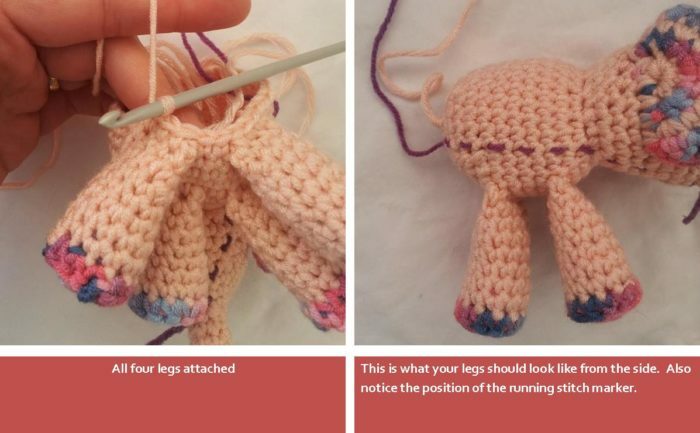 If you are right-handed, you will need to make sure that your end tail of yarn is to the right when you start attaching the ears, not to the left as in this photo. If you are left-handed, your end tail of yarn should be to the left, as in the adjacent photo. This is the only thing you need to change if you are left-handed. Follow the rest of the instructions as written. It will work out. Trust me. 1. With MC: Ch 8. Sl st in the next st. Ch 1 and bind off. Place the foot over the opening at the bottom of the leg with the right side facing you. Insert your hook into the next st of the foot AND from the inside to the outside into any stitch in the last round of the leg (Photo 3). Make a sc through both layers. Continue making 11 more sc’s through both layers (Photo 4). Sl st to the top of the first st. Ch 1 and bind off. 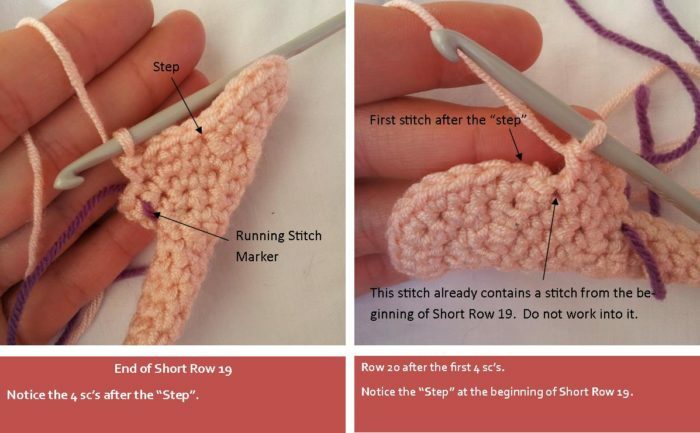 Note: When working the short rows you will notice a “step” where the previous short row ended. I refer to these as a visual reminder that you are still on the right track. I also advise you to use a piece of scrap yarn as a running st marker to mark the beginning of each round. 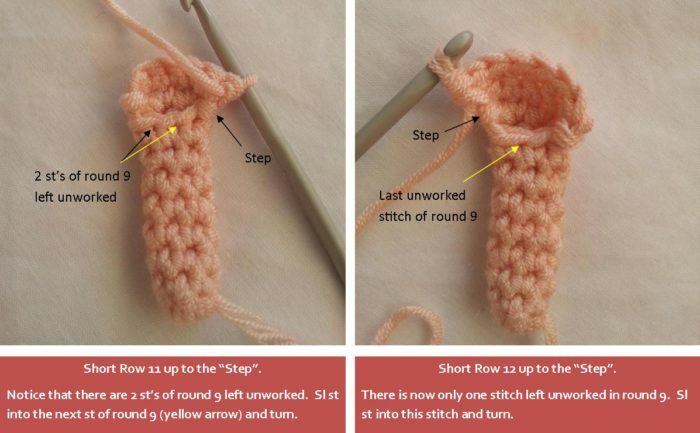 Please see this tutorial if you are at all confused about short rows or running stitch markers. For a more specific look at running stitch markers and working in a spiral, see this tutorial. The sl st’s at the end of the short rows are not included in the st counts in parentheses. If you are going to use safety eyes, you should place them now, before working the last round of the head. Remember to place your eyes far apart, so that they fall on the sides of her head when it’s stuffed. If you’re not sure, stuff the head a bit before attaching the eyes and see if you like the look. Don’t bind off. Stuff the head and continue making the body. Please Note: If you are at all concerned about using safety eyes, try embroidering some eyes with black yarn instead. I always apply some superglue to the back of my safety eyes for extra reassurance. And if these eyes are going anywhere, it’s into the head, not out of it! Please Note: I have used contrasting yarn to better illustrate the attachment. I have supplied stitch counts in parentheses after each step to help you keep track of the stitches. 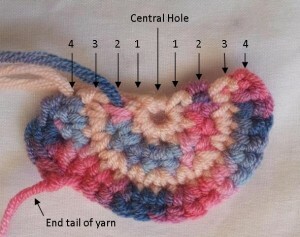 Hold the ear in front of the head and upside down, with the end tail of yarn to the right as in Photo 1 below. (If you are left-handed, remember to flip the ear so that the end tail of yarn is to your left.) You will work the 6 sc’s attaching the ear through both the head and the ear. Please note that your ear should have a little fold at the top where it is attached to the head (Photo 8). Photo 8 illustrates what the ear will look like from the front, obviously NOT with ugly purple stitches showing. The purple stitches are PURELY for illustration. You should end up with a neat little fold at the top of the ear. Hold the ear in front of the head and upside down, with the end tail of yarn to the right as in Photo 1 below. (If you are left-handed, remember to flip the ear so that your end tail of yarn is pointing to the left.) You will work the 6 sc’s attaching the ear through both the head and the ear. 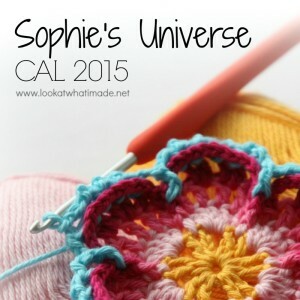 Continue where you left off with the head and remember to use that running stitch marker! It should creep slightly to the right as in Photo 1 below. If it doesn’t, you’ve done something hinky. Photo 8 illustrates that the legs should fall on either side of Meimei’s trunk. Bind off, leaving a 1m/1 yard tail of yarn. Weave the tail of yarn through the last 6 stitches and pull them tight to close the hole (Photos 2 and 3). Now insert your hook around the “hole” by poking it into the elephant on one side of the closed hole and out the other side (Photo 4). Yarn over with the long tail of yarn and pull up a loop (Photo 5). Yarn over and pull through to get your starting chain stitch (Photos 6 and 7). Ch 8 (Photo 8). 5 x hdc in the third chain from the hook (Photo 9). Drop the loop and insert your hook into the first of the 5 hdc’s. Grab the dropped loop and pull it through (Photos 10 and 11). This will give you a little popcorn stitch at the end of your tail. Ch 1 to secure the popcorn stitch. Sl st in each of the 6 ch’s back up the tail. Bind off and work away your tail of yarn. This little rug is an optional extra. To make it a bit more funky, I have decided to use 2 stitches you might not normally encounter: the waistcoat stitch and the crab stitch. I think that this tiny little rug is the perfect opportunity to practice these stitches. Think of it as a little sampler. The waistcoat stitch has a true stockinette finish and I absolutely love the look of it. It is always worked from right to left (left to right if you are left-handed), so is perfectly suited to working in the round. When making rows, though, you have to bind off at the end of every row, which is perfect for this little rug. 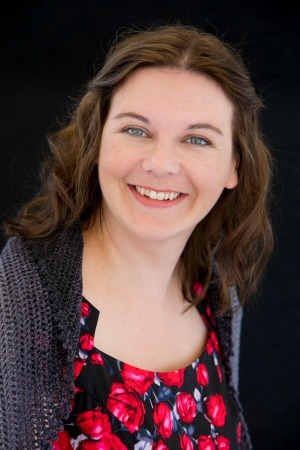 My friend Rhondda did a lovely tutorial for the waistcoat stitch, which you can find here. It includes written instructions and a photo tutorial, and also a link to her video tutorial. 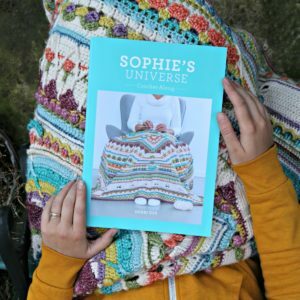 The crab stitch, also called the reverse single crochet, is a lovely, sturdy stitch that looks gorgeous for the finishing round of rugs, shoes, blankets…anything that requires a pretty one-row border. It is always worked from left to right (right to left if you are left-handed) and can prove quite a challenge at first. 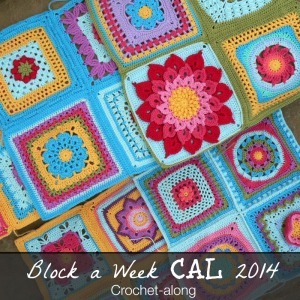 Essentially, you are crocheting backwards. 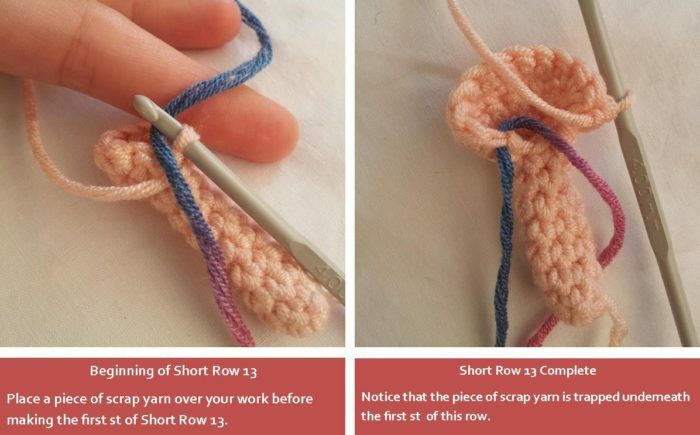 Here is an idiot’s guide to reverse single crochet. And if you need a video tutorial, the link is supplied in the abbreviations at the beginning of this post. Please note: don’t work over your tails of yarn…you are going to use them to make tassels with later on. 1. Ch 18 and bind off. 7. With contrasting yarn and a slip knot already on your hook: starting from the last stitch of the last row, crabstitch in each stitch across. Ch 1 and bind off. 8. With contrasting yarn and a slip knot already on your hook: crabstitch in the remaining 2 loops of each of the foundation ch’s as above. Ch 1 and bind off. Tie overhand knots in the fringe, knotting 1 and 2, 3 and 4, 5 and 6, 7 and 8 together (Photo 1). Then tie knots between the knots you have just made. To do that, tie 2 and 3, 4 and 5, 6 and 7 together (Photo 2). For the last row of knots, repeat the first row of knots, again tying 1 and 2 together (3 and 4, 5 and 6, 7 and 8) – see Photos 3 and 4. I use a big needle to push the knot down so that it abuts the other knots. Finally cut the fringe (Photo 6) and separate the yarn so that it looks more fringe-y (Photo 7). Sew the little rug to Meimei’s back and you are all done. I hope you enjoy your little crochet elephant! 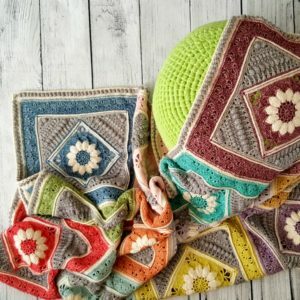 First let me thank you for this pattern, your creative ability and your generosity in making it free. I made this, my first crocheted animal! I had a little trouble with the head but for the most part, it was easy to follow. It turned out so cute. 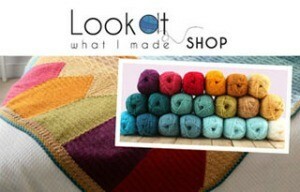 Will definitely look at your other patterns. Thanks so much. Thank you for your comment, Barb. You are most welcome. I love your pattern. I used it to make a present for my teacher and added a cup of coffee. Now I wish to use it to make tons of elephants for an adoption organization that I work with. Thank you for making this pattern so easy to follow and all the pictures. Hi. You can find some larger ears HERE. Hartelijke dank voor het leuke patroontje van de baby olifantje. Ik ga kijken of het mij gaat lukken. Made this for my friends newborn baby! In light gray and mint. I have to say your pattern was by far one of the easiest to follow.. and I learned some new techniques (short rows). I don’t leave comments often on patterns, but I had to say something. Great instructions and pictures! I’m almost done with the body. I might add a couple more rows between ththe legs to make the body a little bigger; but so happy with how the rest turned out. Thank you! Hi Andrea. Thank you for taking the time to comment. I am so pleased that you like little Meimei. This is just the cutest pattern! I didn’t really have problems. Easy to follow and to keep track of stitches and rows; keeping a log of rows and stitches helped. The pictures are very helpful. Thank you! I’m having problems with the body. I’ve completed the head and my little elephant is looking adorable so far, but following the the pattern for the body, I’m ending up with a floppy hat effect rather than the cone shape in your photo. Hi Jamie, I am not sure what you mean. Are you making the hat for the circus elephant, or are you making the body for Meimei? He is adorable. I would LOVE to make him as a Christmas gift for my nephew but I am having an incredibly hard time with this pattern (specifically the head). is there any way you could share a video walk through as well? Please and thank you. Hi Ashley. There are no plans for a video tutorial at present. Sorry! Hi Ashley. If you tell me what you are having trouble with, I might be able to assist you? Row 17 is a sc, 4 increases and another sc (10 stitches), but the pattern says it should be 11. Help please? Thanks! I see my error, so sorry, thank you! I didn’t realize the next stitch was a sc instead of a slip! Hello, I love your pattern. Such a cute little elephant! I am having problems after step 25 though. At step 26 you said to use the running stitch marker, and yours appears to begin below the trunk. My row 26 begins on top of the elephant’s head. Where did I go wrong? It looks just like yours otherwise. Have you got a photo? I think that you might have worked into the stitch that contains the sl st at the base of every ‘step’, but it is hard to tell if I cannot see. 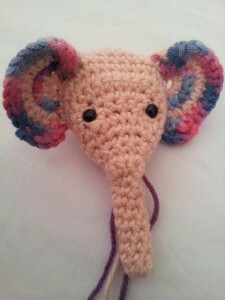 My elephant head was also lopsided, but I am trying this again because it is too cute! Ever since I restarted the head, I have been noticing that there is a giant hole when I start row 14 by connecting to the first stitch in row 13, is this supposed to happen? There should be a small hole there, not a giant one. This hole is not visible once the elephant is completed and does not cause any issues (like stuffing poking out) later on. 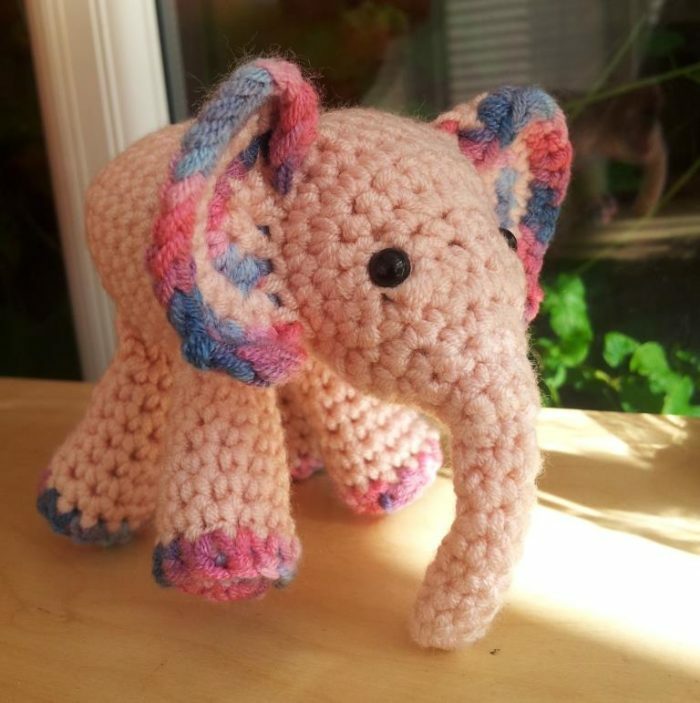 If you would like to try a more traditional approach to making the head, you can find some brilliant elephant patterns here on Ravelry. I have made this one and it is very cute. I’m sorry, I’m have a small problem with one part of this pattern, but I’m pretty sure it’s just my own confusion. After row 20 of the head, do I turn the work or do I not for row 21? I can’t seen to get it right, and I was wondering if you could clear this up for me. I adore how it looks so far, and I don’t want to have to scrap it if I can’t figure it out. Thank you! Nahomi, you do not need to turn at the end of Round 20. 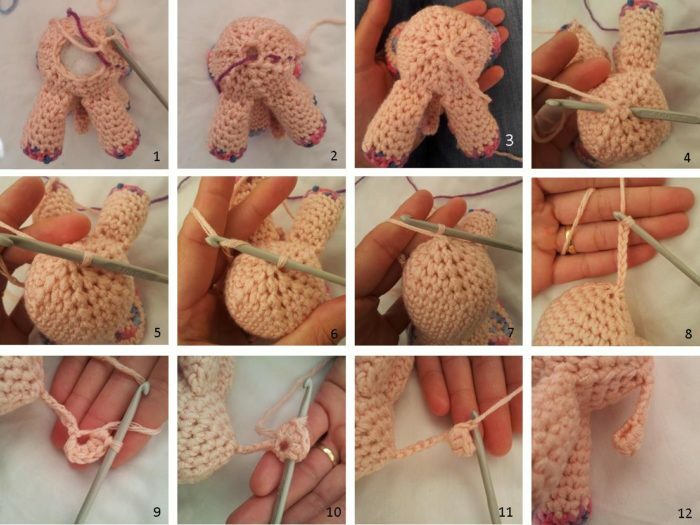 When you have made all the stitches of Round 20, do you end up back at the running stitch marker (under the elephant’s trunk)?